Compare prices on car hire in Edinburgh Airport from all the major brands and find the best deals. When you book through us, unlimited mileage and insurance are always included in the price given. Edinburgh Airport (EDI) is 10 km west of Edinburgh .It is the largest airport in Scotland .The best way to get between Edinburgh and the airport is by bus which runs every 10 minute. The companies that offer car rental Avis, Enterprise, Europcar, Hertz, National and Alamo. 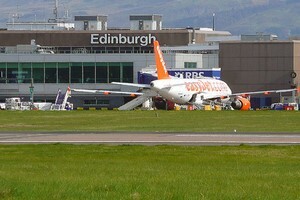 Edinburgh Airport serviced in 2008, 9,006,702 passengers.The five most popular international destinations are Amsterdam , Dublin , Paris , Frankfurt and New York. The airport is the main base for easyJet, Ryanair, Flybe and Monarch, and 40 different airlines flying to and from the airport. Edinburgh Airport has a very good selection of restaurants, cafes and shops. It also has a gallery that exhibits some of the best artists in Scotland. Other amenities include wireless internet, ATM and business center. Hotels close by is The Hilton Edinburgh Airport Hotel and Quality Hotel.